The tired wooden schooner-barge Checotah led a perilous life long before it met its end in a Lake Huron gale just off Michigan’s Thumb Area. It happened on Oct. 30, 1906. The Checotah, with Capt. William Somerville of Berlin Heights, Ohio, at the helm, was laden with lumber. It was the third in a string of three lumber laden barges in tow behind the tug Tempest. Also in the string were the schooners Uranus and M. McVea. When off Sanilac County the vessel sprang a leak and became waterlogged. That is, it was a wooden vessel laden with wood so it was full of water, but still partially afloat, but it was close to sinking. A waterlogged ship in a long tow of vessels could become a severe drag on the steamer at the head of the string under the best of circumstances. But in a storm, the master of the Tempest had no choice but to cut the tow line to save his own boat and the other two vessels in tow. Captain Somerville gave the order to abandon ship and the life boat was launched. Enduring the storm with him were his daughter, Kate, first mate William Lee of St. Clair, and sailors Robert Carey, William Fray and Peter Wood, all of Port Huron. The crew got lucky. After only an hour in that open boat they were picked up by the passing steamer W. A. Payne and taken to Port Huron. The wreck was found by area sports divers in 1988, located 12 miles northeast of Port Sanilac. It lies in more than 100 feet of water. The wreck is badly broken because it sank bow down and struck the lake bottom from that same position. The boat rests upright, tilted slightly to starboard. The starboard side is peeled back from the hull and the deck and cabins are missing. The Checotah was originally built in 1870 as the schooner George D Russell. The Russell was sunk on the St. Marys River, near Sault Ste. 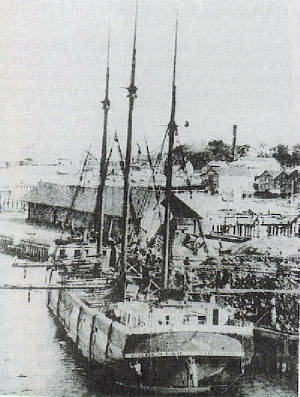 Marie on Sept. 9, 1882, when it was in a collision with the steamer Northerner. It was carrying iron ore at the time and sank so quickly three crew members perished. The Russell was written off by insurance carriers as a total wreck and the boat’s document was surrendered. But because it had a cargo of value, and was a hazard to shipping on the river, an effort was made to raise and salvage it. The wreck remained at the bottom of the river for several years before the tug Gladiator equipped with two divers, steam hoists, tackle and other salvage equipment, succeeded in raising it and bringing the wreck into dry dock for rebuilding. With new timbers and new owners, the vessel began a new life in 1890 under the name Checotah. But the vessel became a hard-luck ship. The record shows that the Checotah stranded on Thunder Bay Island in Lake Huron on May 28, 1899. Her document was surrendered a second time following a wreck at Cleveland on November 26, 1905. But it was salvaged yet again, and went back on the lakes for one more season before it was lost on Lake Huron. Thus the Checotah may be the only vessel in the history of the Great Lakes ever to have surrendered its document and been declared a total loss three different times.